Remarkably, as a musical theater geek, I was unfamiliar with The Drowsy Chaperone. Sure, I’d heard of it and was aware that the protagonist was “Man In Chair." But I didn’t know the songs, the plot or anything. Well I’m a good student, so I Googled a synopsis of the plot the day before. I figured, as a reviewer, my responsibility was to review the production on stage, not the show itself. If I were trying to figure out the plot, I might be distracted from the production I was tasked to review. 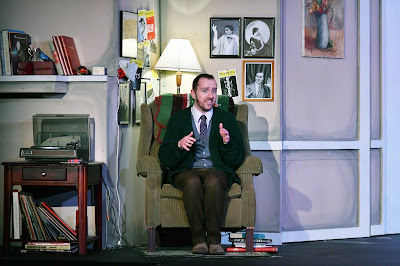 Connor McAndrews as "Man in Chair" in The Drowsy Chaperone. As it turns out, the plot is both familiar and joyously random, so one has no choice but to focus on the production and just go along with the ride. And what a ride it is! The Drowsy Chaperone actually refers to a fictional 1928 show within a show (or rather “a musical within a comedy” as the tagline says) which features a cornucopia of stock characters from the heyday of American musical theater. This includes the self-absorbed romantic leads (Kevin Dietzler and Audrey Simmons); the very wealthy, very dim matron (Lindsay Mauck) and her long-suffering butler (Anthony Connell); the heavily accented Latin lover (Topher Layton); a pair of gangsters straight from central casting (Victoria Healy and Max Redman) and many others. These characters must be played in broad vaudevillian style, vocally and physically. And every member of this cast delivers. There are invigorating showcase numbers, such as Simmons in Show Off, Layton in I Am Aldolpho as well as Dietzler and Shaun Yates tap dancing through Cold Feet. Tiffany Christopher shines as the Drowsy Chaperone herself with As We Stumble Along, described as a “rousing anthem about alcoholism." But what thrilled me even more was when the entire ensemble displayed exquisitely coordinated comic timing. These moments were liberally sprinkled throughout, but a particular dropped cane bit in Act II deserves special mention. The choreography is stylistically spot on and superbly executed. My highest compliment to a show is that it is “tight." Kudos to Director/Choreographer Peter John Rios. And so we come to "Man in Chair" (although, as my companion remarked, he spends very little time actually sitting in the chair). On the surface, Man is the quintessential wide-eyed uber-fan of musical theater, and Connor McAndrews enthusiastically invites us to share his joy and passion. But there’s also a great deal below the surface. While he seeks escapism via his favorite musical, he cannot avoid the encroachment of the less ideal reality of his life. With a masterfully nuanced performance, McAndrews more than meets this challenge. He engenders warm affection for his character, which makes the somewhat surreal final scene all the more affecting. The production values are impressive. Jeff Reim’s clever set seamlessly transforms from a somewhat dingy New York apartment to multiple rooms of a mansion in the Hamptons. Timothy Lamont Cannon’s costumes and Lisa Miller Challenger’s wigs & hair transport us to 1928 society. Light and sound cues are intricate and demand split-second timing, so hats off to the operators in the booth. In sum, The Drowsy Chaperone — much like the Marx Brothers comedies on which it is loosely modelled — is a madcap, raucous laugh-riot not to be missed!